I’m currently reading Nelson Mandela’s autobiography, “Long Walk to Freedom,” published in 1994. I’m only half way through the book, but as today is Mandela’s funeral, I wanted to share an excerpt about the creation Freedom Charter, which was inspired by ideas of thousands of South-Africans, and therefore relates to my current topic of interest, crowdsourcing. In 1955, the South African Congress Alliance indeed invited citizen to submit their ideas for a statement of core principles for the country, and they gathered thousands of ideas. In 1955 (Mandela was 37 years old), in preparation of the Congress of the People (COP), Nelson Mandela’s African National Congress (ANC) and other political partners called on all South Africans to send in proposals for ideas to create a post-apartheid South-Africa based on a democratic and non-racialist state. “The ANC sent out fifty thousand volunteers into townships and the countryside to collect ‘freedom demands’ from the people of South Africa,” Wikipedia describes. Here’s the excerpt that explains the initiative from Mandela’s perspective. I translated from pages 210 and 2011 of the French edition, “Un long chemin vers la liberté,” I hope it is accurate. WE ARE CALLING THE SOUTH-AFRICAN PEOPLE, BLACK AND WHITE. – LET’S TALK ABOUT FREEDOM TOGETHER […] LET THE VOICE OF ALL BE HEARD. MAY THE DEMANDS FOR OUR FREEDOM BE WRITTEN DOWN. MAY THESE DEMANDS BE GATHERED IN A GRAND FREEDOM CHARTER. The call ushered peoples’ imagination. We received proposals of sport and culture clubs, of gatherings of supporters and ratepayers, of feminist organizations, of schools, of union sections. They were written on scraps of paper, backs of envelopes, pages torn from school exercise books, and often the backs of our own handbills. It was humiliating to see that suggestions of the people were often more advanced than those of the leaders. The most often cited was: one-man-one-voice. And we recognized that the country belonged to everyone who lived in it. After this call for participation, the proposals were gathered and a synthesis was sent out to different regions and committees for feedback and criticism. Then the charter was drafted by “a small committee of the National Action Council and reviewed by the ANC’s National Executive,” as Mandela explains in his autobiography. 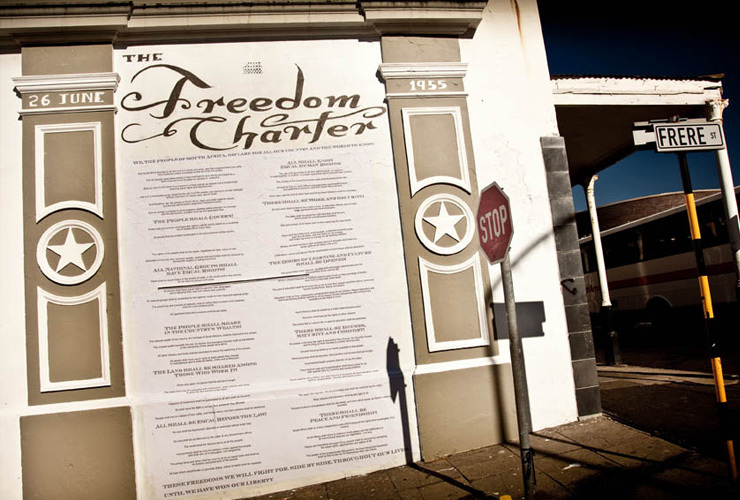 On June 26th 1955, the Freedom Charter calling for democracy and human rights, land reform, labor rights, and nationalization, was adopted at the Congress of the People, in Kliptown. It is a historical date in the History of the country. I am probably reading “Long Walk to Freedom” as you read this, and encourage you to do the same. It is a very inspiring book written by a Man who changed the world for the better. The world is paying tribute to him today, and I found this part of his story interesting enough to be shared. As a tribute, here’s a clip of Johnny Clegg’s 1999 concert, where Nelson Mandela appeared on stage in the middle of the song (02:40), surprising both performers and spectators.